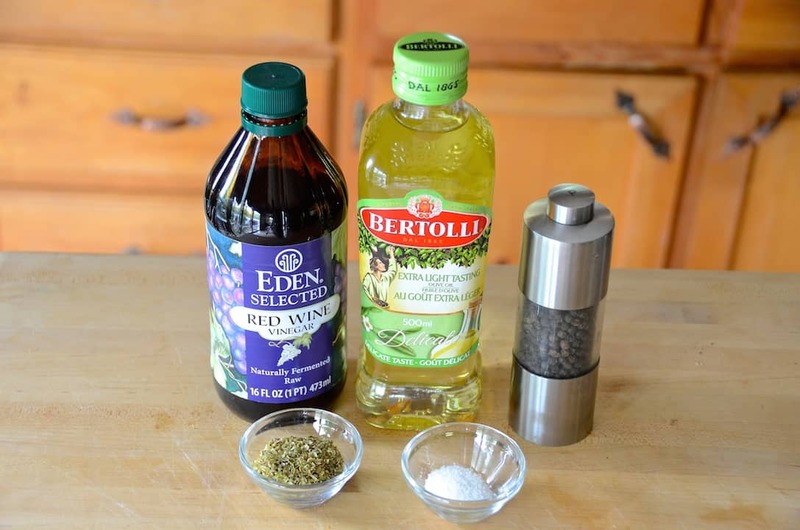 Prepare the vinaigrette: place the oil, vinegar, oregano and salt in a small bowl. Whisk together and set aside. 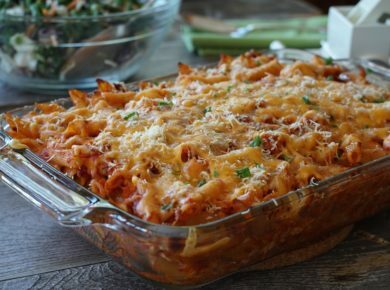 Prepare all of the vegetables, cheese and olives and transfer to a large salad bowl. Toss. Add the vinaigrette and toss again. 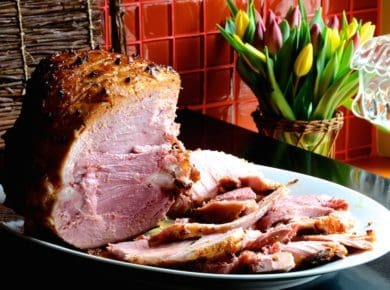 Adjust flavour with salt and pepper and serve immediately. A gorgeous salad of crunchy vegetables, cut into chunks and tossed with cheese and whole olives. 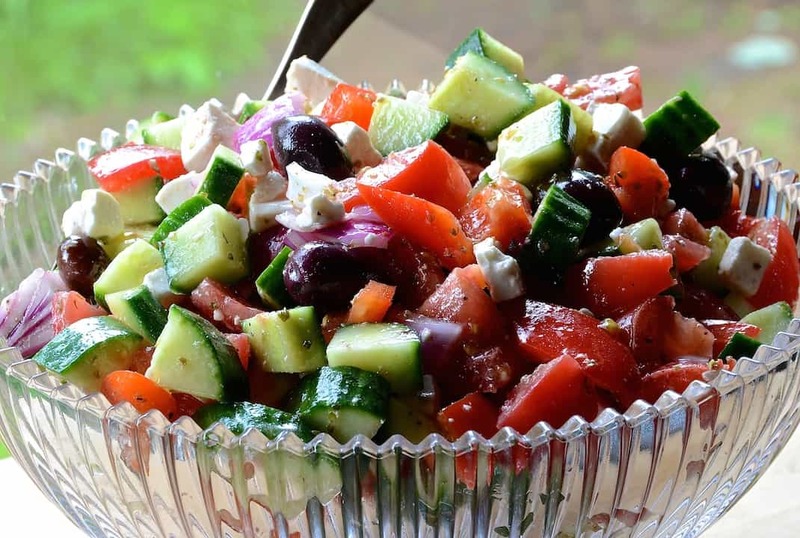 Let’s hear it for a classic GREEK SALAD! 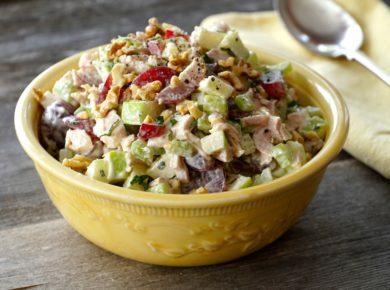 This time-honoured salad is deserving of its fame. 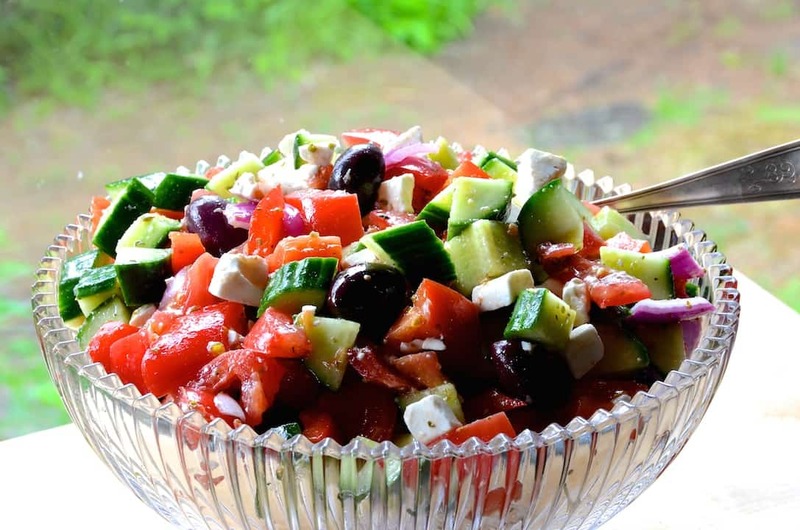 I remember travelling to Greece and being surprised to see GREEK SALAD – also referred to as a Horiatiki or village salad – served at breakfast. I was more than happy to enjoy it first thing in the morning; it’s fabulous anytime. Of course so is a trip to Greece to try the salad in its country of origin. Head HERE to read an article written by our friends – Over 100 things to go in Greece! OPA! VINAIGRETTE – Yet another example of how we often need just a few choice ingredients to create memorable flavours. I think it essential to use a quality olive oil for this recipe, and dried oregano is the only way to go. I have tried making it with fresh chopped oregano thinking I’d revolutionize the Greek salad industry and teach Greeks a thing or two. 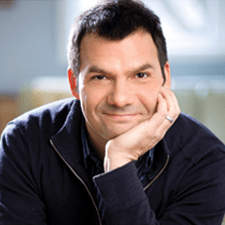 It was all wrong – just like my intention, LOL! 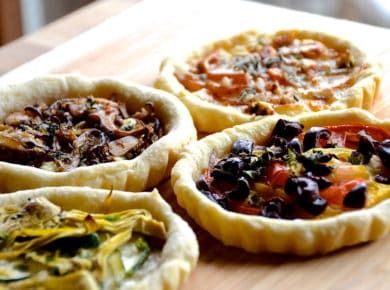 VEGETABLES – In a perfect world, we’d all live close to where I grew up in Essex County, and we’d drive a county road and get farm-grown fresh produce. Picking up locally grown tomatoes, cucumber, red onion and bell peppers heighten that farm-to-table flavour. KALAMATA OLIVES – These large, dark purple olives hail from Kalamata Greece. 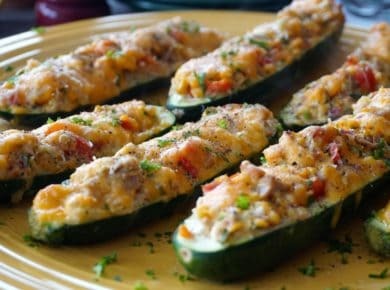 They have a meaty texture and add richness to the salad. When purchasing them, look for those that haven’t been pitted. 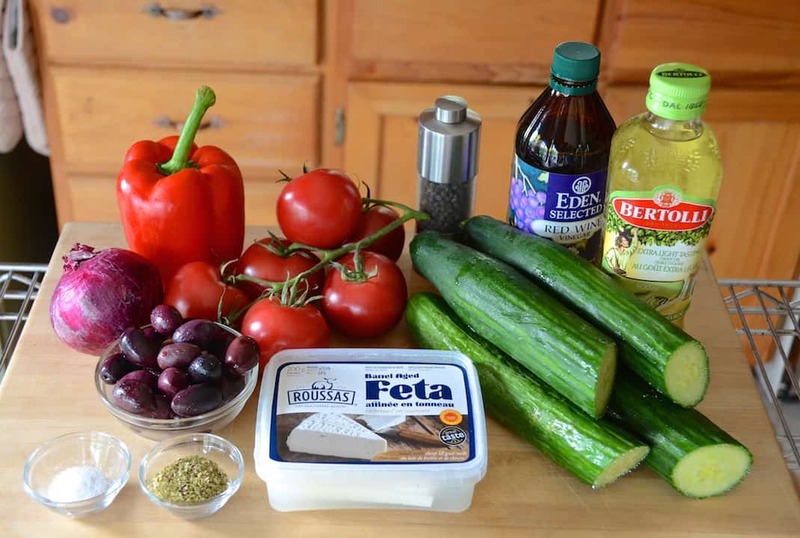 FETA CHEESE – This Greek cheese has a distinct salty flavour that works really well with the prepared vegetables. Made from both sheep and goat’s milk, feta is actually a brined curd. I suggest trying to find this essential ingredient at a Greek grocer or cheese store. Ask for the hunk of cheese to be packed up in a container with brine, making it more flavourful. Prepare the vinaigrette, chop up the veggies, dress, toss and serve. 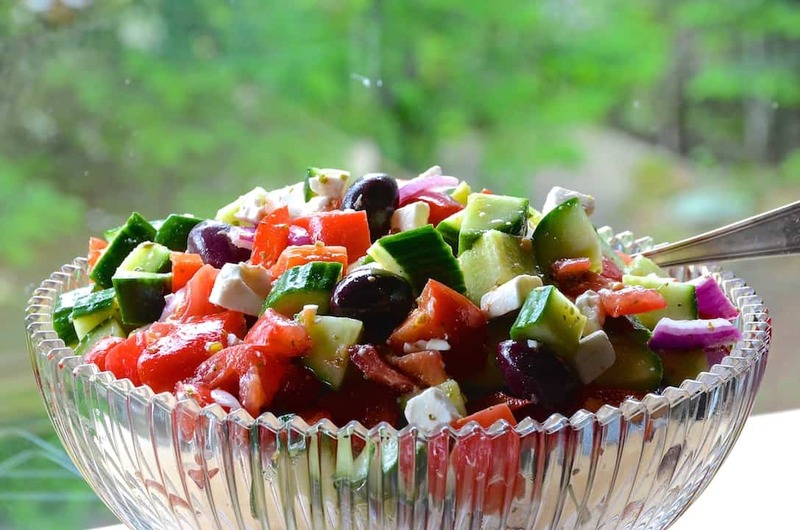 Enjoy this classic GREEK SALAD, a taste sensation.